Offering you a complete choice of products which include nitrogen oxygen production plant, oxygen nitrogen gas plant, oxygen and nitrogen cylinder filling plant and oxygen nitrogen plant. Our company is known for manufacturing and fabricating nitrogen oxygen production plant that uses cryogenic distillation process. 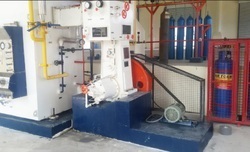 Fabricating of the oxygen nitrogen plant machinery is done in compliance with international standards and regulations. We fabricate the plant machinery employing the most cutting-edge fractional distillation technology. Our customers use oxygen plants for generating oxygen for use in medical and industrial application. It works on the principle of Linde Claude, developed in 1930s. Our nitrogen oxygen production plant is trusted by customers because of our reliability, durability and smooth performance. Our commitment to deliver quality nitrogen and oxygen plants to our customers that are fabricated with the application of cut-edge technology. We have made our reputation by virtue of our commitment to high standards and superb customer service. Being a customer driven company, our company builds oxygen nitrogen generator plants that meet the expectations of customers. By keeping track with the market development, we are offering optimum quality Oxygen Nitrogen Gas Plant. Our offered plants are widely appreciated by our prestigious clients for its salient features given below. These plants can also be availed in various models and other related specifications. Our provided plants are manufactured by a team of our adept professionals utilizing quality approved components and advanced technology. 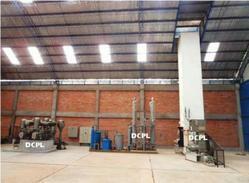 DCPL is acclaimed for manufacturing and fabricating high-quality oxygen /nitrogen cylinder filling plant. Top quality raw materials are used in the fabricating of the plant machinery. In order to ensure that the machinery is top-class, we import the cutting-edge cryogenic distillation technology for manufacturing and fabricating of the oxygen plant machinery. The company is renowned all over the globe for its manufacturing credentials. Cryogenic technology is based on the process cycle of Linde Claude, which was developed in the year 1930. We manufacture and fabricate oxygen nitrogen plants of all sizes and capacities ranging from 20m3/hour to 5,000m3/hour. Our factory is located in New Delhi (India) where we also have a fully equipped R D center, where our experienced engineers and technicians innovate and update Oxygen /nitrogen cylinder filling plant in accordance with the evolving needs of the clients. Our oxygen production plants are at par with the best in the world. Our oxygen /nitrogen cylinder filling plant is unmatched in its performance, innovation and prices. Each oxygen gas plant is put through rigorous testing before it is approved for shipment to the clients. Our oxygen gas filling plants are technologically superior and designed superbly to deliver seamless performance. We have been given ISO 9001:2008 and CE certifications. 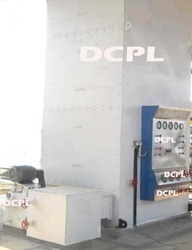 We are top manufacturer of oxygen and nitrogen plants. Ever since our inception in 1987, we have followed three cardinal principles-excellence, innovation and reliability- for manufacturing high value products. We use advanced technology for fabricating oxygen nitrogen plants. High quality raw materials are used in the making of oxygen nitrogen plant machinery. Our oxygen nitrogen gas plant is reputed for smooth performance, reliability and durability. Our company has made a name for itself for offering oxygen nitrogen gas manufacturing plant that are unmatched in innovation, performance and pricing. Our machines come in different sizes and capacities ranging from 20liter/hour to 5,00liter/hour. We offer hospital oxygen plant, which guarantees generation of oxygen with purity up to 99.7%, which is sufficient for medical use. In the engineering sector, we are well-established as the leading manufacturers of oxygen nitrogen plants. We have been given numerous quality certifications ISO 9001:2008 and CE for our compliance with strict quality control measures. Since our establishment in 1987, we have been able to sell over 500 medical production plants to our clients in over 40 countries including Saudi Arabia, Kuwait, Qatar, Oman, Yemen, Nigeria, etc. Our clients are satisfied with the performance and quality of our oxygen nitrogen generator plant.